In order to contribute to the discourse of postcolonial Vietnam through visual culture, this paper examines the critical work by Vietnamese filmmaker Nguyễn Trinh Thi, Vietnam The Movie (2016)—a collage documentary that combines several excerpts from Vietnam-related movies. Thus, this article analyses the cultural and aesthetic approach the movie foregrounds in collecting and preserving postcolonial moving images to reframe Vietnam’s recent history. By compiling visual depictions of iconic and historically significant events in a creative assemblage—from Hollywood cinema to arthouse and Asian films—Vietnam The Movie traces Vietnam’s history between the end of French rule in the 1950s to the conclusion of the Vietnam War. Because the perception of Vietnam in recent history is to a large extent based on the events surrounding the war, the period framed by the movie is of critical relevance to the investigation of the corresponding resituated images conducted by this paper. The structure of Vietnam The Movie is broadly an historical one by appropriating selected archival footage in a documentary format that allows, in pioneering documentary maker John Grierson’s words, “original” scenes to tell the story.5 The film opens chronologically, as the war itself had unfolded, with an extract from the French film Indochine (1992), revealing an intimate conversation between the protagonist Eliane and her adopted son Etienne about their relationship. The location is Geneva; crucially, the intensity of their encounter reflects the magnitude of a concurrent event, the Geneva Conference that was formalised on 21 July 1954. By early May 1954, France had relinquished any claim to Vietnamese territory. Furthermore, the Geneva Accords delineated the northern and southern zones in Vietnam to which opposing troops of each origin were instructed to return to. These events of 1954 marked the beginning of the involvement of the United States and the ensuing Vietnam War. After the opening sequence appropriated from Indochine, Vietnam The Movie cuts to a series of clips from Born on the Fourth of July (1989), The Deer Hunter (1978) and Forrest Gump (1994), with the respective protagonists expressing their intentions or hesitations to go to war halfway around the world. From Born on the Fourth of July, Ron Kovic’s father does not dissuade his son from going to Vietnam but deplores, “…13,000 miles, it’s a long way to go to fight a war.”6 The audience is transported to the thick of the American War, commonly referred to as the Vietnam War, and, to a lesser degree, the Second Indochina War. With an estimated 1.1 million Vietnamese and 58,000 American deaths,7 the Vietnam War effectively started after the Geneva Conference was formalised. The bloodshed between the American-backed South Vietnamese government and North Vietnam, backed by the Soviet Union and China, lasted over 20 years, ending with the fall of Saigon to the North Vietnamese troops, with the defeat of US and the reunification of Vietnam. As Winston Churchill once asserted, “history is written by the victors”, the history of Vietnam should have perhaps been told differently, for the most vocal accounts of the war have been given by not the victorious but the defeated—an inequality of voices that Vietnam-war writer and academic Viet Thanh Nguyen explains in these terms: “…while the United States lost the war, in fact, it won the war in memory on most of the world’s cultural front outside of Vietnam, dominating as it does movie making, books publishing, fine art, and the production of historical archives.”8 While I will return to the theme of memory later in this essay, here I would like to focus on the mediatic effect that , the Vietnam War has generated in recent history through the proliferation of its reinterpretations, each escaping a singularity of viewpoint, from books recording and recounting the events, to documentaries and films, largely, though not uniquely, through the lens of American culture. In this plurality of histories, fitted to fulfill national and political agendas, can we find order and linearity of meaning? Filmmaker Nguyễn Trinh Thi seems to ponder on the various connotations of Vietnam, a name that has become synonymous with war. The recycled footage, some dating back as early as 1958, such as the American film The Quiet American, to the 1970 West German film Der amerikanische Soldat (The American Soldier) and Bengali film Pratidwandi (The Adversary), are adapted and treated with surgical precision as archival fragments to re-examine Vietnam’s recent history through the lens of the familiar, albeit visually subverted, popular culture. A side note here is in order to explain the word ‘archival’. In general, the public audience may perceive an ‘archive’ as a collection of historical documents or records that provide information about a place, institution, or group of people. This perception holds relevance to the context of this paper; when we watch these films, renowned accounts by illustrious “authors”, we need to remember that they are, after all, a second-hand, somewhat subjective interpretation of Vietnam’s history. This logic then begs the question of whether or not these films become a “secondary archive” of the actual events that had taken place in Vietnam, thus complicating the value of revisiting them. To a large extent, these films represent the prevailing popular media and information transmission of the Vietnam War in the last 40 years. The archival value of these films in relation to Vietnam The Movie, I argue, is paramount in their visual-cultural legacy in defining the national identity of Vietnam through the collective memory of the Vietnam War. Collective memories are not necessarily uniform since they are based on the memory of unique individuals. In the case of the Vietnam War, the American and Vietnamese individual and collective memories are equally relevant, however, unequally presented to global attention. The former has stronger and wider mediatic power than the latter. Indeed, what have remained imprinted in our minds over the last 40 years are the iconic sequences of the Russian roulette scene in The Deer Hunter, the “Ride of the Valkyries” assault in Apocalypse Now (1979) or disc jockey Adrian Cronauer’s (played by Robin Williams) comedic radio broadcasts in Good Morning, Vietnam­ (1987), to name but a few. By subverting the linearity of selected fictional productions—archival material in their own right—Vietnam The Movie is able to challenge and reposition the collective memory of the war, shaped over time by the aesthetics of the very same productions. Mediatically, these productions were made to emphasise, celebrate, condemn or simply tell the story of the war. Abiding by the visual strategy of association, the viewer’s eye, in constant struggle for linearity of narrative and further frustrated by the complexity of sounds and dialogues, establishes the optic connection between the disparate clips. This assimilation in turn enacts a deeper, personal relation to the excerpts that leads the viewer to reconsider, and to reposition, preconceptions of the war. Thus the assemblage of recycled footage acquires a new, “alternative” aesthetic. The seamless juncture of the two overtly disparate excerpts is commendable, thus the war’s raison d’être through the “lenses” of the American propaganda morphs quite literally into the multiples lenses worn by anti-American, French alter ego, Guillaume. The second example is the intellectual combustion between the French collective movie Loin du Vietnam (1967),14 followed by the American advertisement Batman for US Savings Bonds (1966). The premises are set by the intellectual crescendo of a male Parisian who declares, “I know a place where they give ‘Vietnam meals’. For 1000 francs you can get a bowl of rice, the proceeds go to the Red Cross.”15 His inflammatory monologue on the intellectual climate of the war bleeds into, quite remarkably, the US advertisement to raise money for the war—Batman, the familiar and benevolent superhero, reads a personal message from President Johnson asking children to invest in Savings Bonds in support of the troops in Vietnam “to [learn] the lesson of practical citizenship…and to [give] important support to the cause of freedom and to the men who fight for us in Vietnam.”16 Here, too, the intellectual association defies any logic, abiding to the association of forms whereby one ethos is replaced and subverted by the other. J’ecoute la pubilicite a ma radio. Grace a E-S-S-O, je conduis sur la rue des reves et j’oublie le reste. J’oublie Hiroshima; j’oublie Auschwitz, j’oublie Budapest; j’oublie le Vietnam; j’oublie le SMIG; j’oublie la crise du logement; j’oublie la famine aux Indes. I listen to the adverts on my radio. Thanks to ESSO I drive on the street of dreams and I forget the rest. I forget Hiroshima, I forget Auschwitz, I forget Budapest, I forget Vietnam; I forget the minimum wage, I forget the housing crisis, I forget the famine in India. The use of a voice-over clip at this late point in the movie finally harmonises image and sound, in this case the incorporeal voice of Godard, towards an intimate moment of reflection. In the 1970s Godard produced a number of movies, many featured in Vietnam The Movie, in which he expresses his concerns over the war and explores the role of the artist as activist and art as activism. Throughout his artistic production Godard relates to the cinematic medium as the archive of time, and as the conduit between history and memory. Nguyễn Trinh Thi’s decision in adopting Godard’s work to sign off Vietnam The Movie sends a crucial message to the attentive viewer, that the cinematic medium is indeed empowered as a record of history through memory and recollection. However, Nguyễn Trinh Thi’s actual selection and collection of archival material, negotiated and re-situated in Vietnam The Movie, offers to the viewer an alternative memory of history, even if lost to the multiplicity of symbol and intent, that is as collective as it is individual. Hence, to summarise, this essay hopes to contribute to the discourse of postcolonial Vietnam through visual culture by examining Vietnam The Movie’s strategy of adopting the creative montage of excerpts from Vietnam-related movies to re-evaluate the country’s recent history. To do so this paper not only looks at the plurality of histories and, arguably, the ownership of memory through the notion of collective memory, but also explores and analyses the visual strategies that enabled Vietnam The Movie to appropriate and resituate, in the discourse of postcolonial Vietnam, historical images or depictions of significant events as reproduced by contemporary mediatic culture. While researching Vietnam The Movie, did you access the original war archive of the United States? Are there any Vietnamese video archives? If so, are they accessible? I collected and watched videos from many different sources, anything I could find, including army and educational films from US. My first editing of Vietnam The Movie included many of those. Gradually, I reduced documentary and didactic materials and focused more on fiction. The archive in US we can access online is https://archive.org. There is the national film archive in Vietnam, controlled by the government and very hard to access. LP: As part of my paper I am investigating the relevance of archival material and what is available on the Vietnam War besides film productions. Would you call these film productions a “secondary archive”? After all, they do provide (bias) information. NTT: My original focus was not on war films, but on the perceptions of Vietnam from outside. But naturally the perceptions are mostly of the Vietnam War anyway. Ultimately, with Vietnam The Movie, I was more interested in the popular perceptions around the world, though, not so much the official ones. LP: Which do you feel were the political and aesthetic implications for you in making Vietnam The Movie? Did you ask yourself what was politically correct? What was the main element that steered your narrative—or absence of logical narrative? NTT: I guess I don’t ask myself what was politically correct. My interest in making work is to ‘collaborate’ with the material, which means during the process I will have to negotiate with them. Therefore I do not work with a top-down attitude. Although I might be the one who comes up with the rule of the game. In Vietnam The Movie, the rule is that every single clip that used in the film has to contain the word ‘Vietnam’, preferably if a character utters that word. I also have some logic for the flow of the film: 1. The clips are organised to tell the story of the war/history by a chronological order. You can see it commences with the end of the Indochina War, then the start, progression, acceleration, and end of the American War, then after the war; 2. It follows the story of the individual soldier, from leaving for Vietnam, his arrival, being injured [at war], back to America, [and his life as] veteran etc. The film follows a logic of association rather than a logic of dramatic narrative as in conventional cinema. The film attempts a re-reading of this composed archive while resisting the comprehensibility and linearity of history. The anticipation of perspective in this new narrative is illusive; there is the logic of form through which no overt conclusion can be reached. In the complex nature of this narrative, the multilayered perspective of many can only permit a shifting and fragmented history that is full of gaps; unlike its authorised cousin, it is naturally incomplete. LP: The last work by Godard is a crucial work, I think, not strictly about the war but for its cinematic value—also for the theme of memory and history. I wonder was it a conscious and strategic decision to place this work at the end (besides the previous excerpts)? Have you been inspired by him in your practice? NTT: Godard’s films mention ‘Vietnam’ the most times—in six or seven films. You might have noticed that many of the films I used in Vietnam The Movie were not war films or films on Vietnam per se. Rather I was more interested in the ones where the Vietnam War was the “backdrop”, like if you were living in Europe and watch the Vietnam War happening on television in the background. Though it seeps into your subconsciousness, somehow, for example, the scene from Persona by Bergman in which the woman watches TV in her hospital ward. It is very interesting for me to look at Godard’s works regarding the Vietnam War, and his thinking as an artist and intellectual on how to engage with such a faraway war, or, maybe more generally, the relationship between art and activism. This theme reoccurs in many of his works, from Masculin/Feminin and La Chinoise in the 1960s to Tout va bien and Here and Elsewhere in the 1970s. This self-reflection concerns me quite often in my practice. The placing of the last scene in the film was very significant indeed. The very last picture that we left the film with was of the advertisement of consumer products. I think at that point, Godard was probably quite pessimistic with the leftist movement in Europe. I think this picture can hint to my perspective to postwar present-day Vietnam as well. 1 For the mediatic power of the Vietnam War, see Rick Berg, “Losing Vietnam: Covering the War in the Age of Technology,” Cultural Critique No. 3 American Representation of Vietnam (Spring 1986): 92–125. 3 Referencing Freud, writer and academic Viet Thanh Nguyen insists on the importance of memory, and the need to work through the past not only individually but also collectively in the case of war trauma of large communities. See Viet Thanh Nguyen, Nothing Ever Dies: Vietnam and the Memory of War (Massachusetts: Havard University Press, 2016), 16–17. 4 John Berger, Ways of Seeing (London: Penguin Books, 1975), 12. 5 In his 1932 essay “First Principles of Documentary”, Grierson insists on the importance of the documentary as a tool to observe life, which could be channelled in an art form. In this sense, the “original” actor and scene are more suitable than their fiction counterparts in understanding the reality around us. Grierson coined the term “documentary” based on his mode of practice. See John Grierson, “First Principles of Documentary (1932),” in The European Cinema Reader, ed. Catherine Fowler (London: Routledge, 2002), 39–48. 6 Nguyễn Trinh Thi, Vietnam The Movie (Hanoi, 2016), 4:23–5:00. 7 Andrew Wiest, The Vietnam War 1956–1975 (New York: Routledge, 2002), 85. 8 Viet Thanh Nguyen, Nothing Ever Dies: Vietnam and the Memory of War (Massachusetts: Harvard University Press, 2016), 14–15. 9 Nguyễn Trinh Thi, email interview with author, May 7, 2017. See Appendix A for the interview transcript. 10 Halbwachs takes the example of how pilgrims to the Holy Land over the centuries have evoked very different images of the events of Jesus’ life. See Maurice Halbwachs, On Collective Memory, ed. Lewis A. Coser (Chicago: University of Chicago Press, 1992). 11 Viet Thanh Nguyen, Nothing Ever Dies: Vietnam and the Memory of War (Massachusetts: Harvard University Press, 2016), 107. 12 Nguyễn Trinh Thi, email interview with author, May 10, 2017. In her statement, Nguyen Trinh also declares, “There is the logic of form through which no overt conclusion can be reached.” See Appendix A for the interview transcript. 13 Nguyễn Trinh Thi, Vietnam The Movie (Hanoi, 2016), 13:20–14:54. 14 Loin du Vietnam (Far from Vietnam), directed by Jean-Luc Godard, Chris Marker, Alain Resnais, Agnès Varda, Joris Ivens, William Klein and Claude Lelouch, symbolically inaugurated the rise of left-wing cinema and the political upheaval known as May 1968. 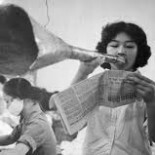 See “Loin du Vietnam (1967), Joris Ivens and Left Bank documentary,” Jump Cut: A Review of Contemporary Media, accessed June 1, 2017, https://www.ejumpcut.org/archive/jc53.2011/WaughVietnam/3.html. 15 Nguyễn Trinh Thi, Vietnam The Movie (Hanoi, 2016), 23:46–23:48. 16 Nguyễn Trinh Thi, Vietnam The Movie (Hanoi, 2016), 24:23–24:50. 17 Eisenstein is considered the father of montage. Since he first introduced montage, it has been adopted in filmmaking in attempts to extend the imaginative possibilities of the film. See Sergei Eisenstein, Film Form: Essays in Film Theory, ed. Jay Leyda (New York: Harcourt, 1949). 18 Walter Benjamin, “The Work of Art in the Age of Mechanical Reproduction,” in Illuminations, trans. Harry Zohn, ed. Arendt (New York: Schocken Books, 1986), 217–52. 19 Nguyễn Trinh Thi, email interview with author, May 10, 2017. See Appendix A for the interview transcript. 20 In Godard’s voice-over in 2 ou 3 choses que je sais d’elle, he hints to the fact that he had been brought to zero, “…and I have to start from there”, which refers to the end of the Hollywood cinematic example. See Richard Brody, Everything is Cinema: The Working Life of Jean-Luc Godard (New York City: Henry Holt and Company, 2008), 291. 21 Nguyễn Trinh Thi, Vietnam The Movie (Hanoi, 2016), 45:37–45:40. 22 Nguyễn Trinh Thi, Vietnam The Movie (Hanoi, 2016), 45:56–46:37. Loredana Pazzini-Paracciani is an independent curator, writer and lecturer of Southeast Asian contemporary art. Encompassing critical social and political issues, Loredana’s rigorous research and continuous dialogue with artists and art professionals leverage Southeast Asian contemporary art through her collaborative curatorial projects.Based in London and Bangkok, Loredana is currently editing a debut compilation of essays titled Interlaced Journeys: Diaspora and the Contemporary in Southeast Asian Artthat explores the connections between diasporic movements and contemporary art in Southeast Asia. Benjamin, Walter. “The Work of Art in the Age of Mechanical Reproduction,” in Illuminations, trans. Harry Zohn, ed. Arendt (New York: Schocken Books, 1986), 217–52. Berg, Rick. “Losing Vietnam: Covering the War in the Age of Technology,” Cultural Critique No. 3 American Representation of Vietnam (Spring 1986): 92–125. Berger, John. Ways of Seeing (London: Penguin Books, 1975. Brody, Richard. Everything is Cinema: The Working Life of Jean-Luc Godard (New York City: Henry Holt and Company, 2008). Eisenstein, Sergei. Film Form: Essays in Film Theory, ed. Jay Leyda (New York: Harcourt, 1949). Grierson, John. “First Principles of Documentary (1932),” in The European Cinema Reader, ed. Catherine Fowler (London: Routledge, 2002), 39–48. Halbwachs, Maurice. On Collective Memory, ed. Lewis A. Coser (Chicago: University of Chicago Press, 1992). Nguyễn Trinh Thi, Vietnam The Movie (Hanoi, 2016). Wiest, Andrew. The Vietnam War 1956–1975 (New York: Routledge, 2002). Nguyễn Trinh Thi, email interview with author, May 7, 2017. Nguyen, Viet Thanh. Nothing Ever Dies: Vietnam and the Memory of War (Massachusetts: Havard University Press, 2016).